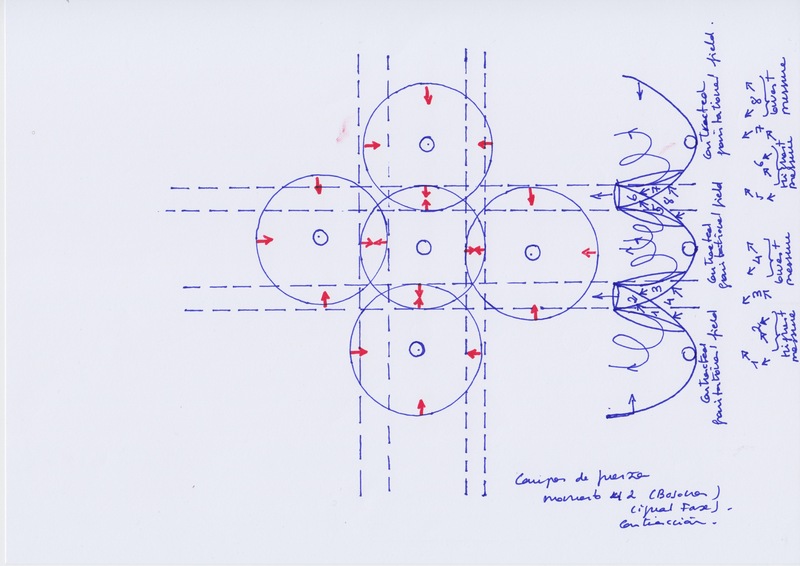 We think that electric charges are displacements of intersected spaces that vary periodically. We consider that those spaces that vary periodically are gravitational fields expanding and contracting. We think that it is necessary to review the currently accepted ideas about atomic electric charges. In our opinion, it is a question of vital importance for a better comprehension of all human deseases. The phenomenon of live is electrical. If we have a limited and unreal comprehension of what electricity is, we can not comprehend truly the chemistry of live and our own human physiology. All cells are bioelectrical. We think that if the current and paradigmatic atomic model were changed, it would be possible to acquire a new perspective of chemistry and biology. In this blog we have put the general ideas, theories and hypothesis that we have thought through the last 6 years looking for a physical, mechanical and rational explanation about why cell division sometimes occurs in a disordered and indefinite way. We looked for a physical explanation about cancer and we found out, surprisingly for us, that the currently accepted atomic model is a wrong interpretation of reality. Current science do not know what electromagnetism is and how it is related with gravity. This has been and continues being the unique goal that we have pursued and we will continuous pursuing it with all our reflexions about physics. We consider that it is a mistake to think that only professional physics can thing about physics and that they only have this responsibility. All people without exception is able with his or her rational mind and her or his natural observation and intuition, think about what nature is. Nature is not complicated in its simplest mechanisms; its most complicated, are only combinations of them. Current science is not able to offer a simple explanation of the simplest natural mechanisms. It sounds bad at the beginnings of the XXI century and our apparently sophisticated technology but for it is so. I encourage you to start thinking by yourself. There are no geniuses, there are people who think by themselves and people that do not think by themselves. Nature is simple, and understandable for all of us. An electron is, for us, a field that moves periodically. Electrical charges are spatiotemporal issues, as gravity itself. They are created by the intersection of two fields that vary periodically. We have developed this simple idea in all the posts of this blog. Through different concrete applications we are repeating always the same idea: Gravitational fields expand and contract periodically. Gravitational entanglement of periodically variable fields are the key for comprehending Nature and the mechanisms of live. 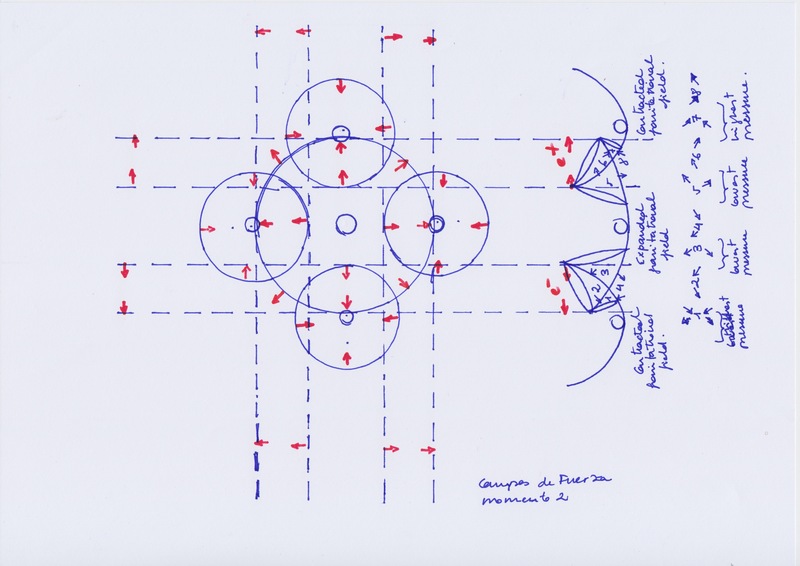 We think that this simple change of perspective,to consider electromagnetism like cyclical spatial displacements, periodical spatial transformations, open the possibility for different comprehensions of already known phenomenons and suggests new ways to confront them. Two intersected gravitational fields create four new dimensions. If this intersected gravitational fields vary with opposite phases, when one of the expands the another contracts and vice versa, the consequences are different that if they vary with the same phase, they both expand or they both contract at the same time. We have commented these consequences in different posts on this blog: Redox and Acid Base reactions and so on, Water as a non Hydrogen molecule, fundamental particles, all suggesting the necessity of a new chemistry based on the modulations of atomic gravitational variations through wave phases modulations. 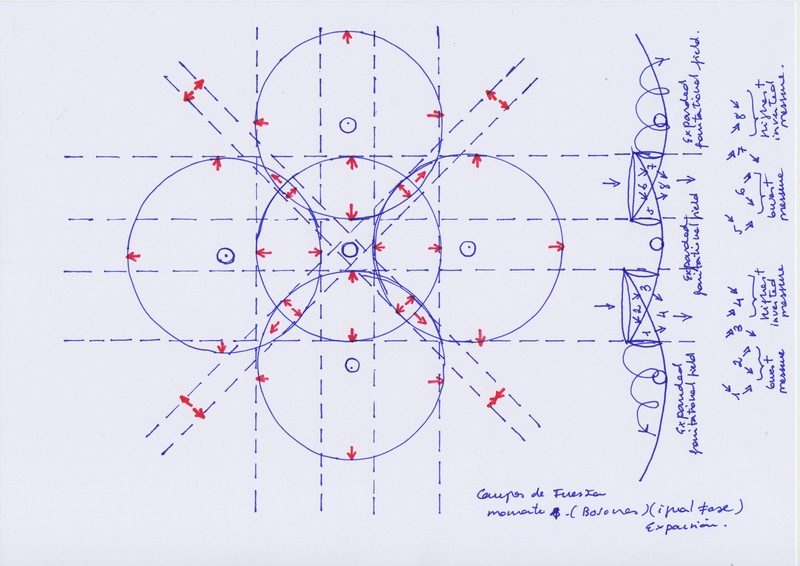 In the pictures below I have drawn five entangled circular fields. In the first picture, a central gravitational field contracts when the other four, placed around it, expand. It could be a molecular formation or a cellular tissue. All things follow the same kind of mechanisms, with their particular spatial distributions and their frequencies of variation. 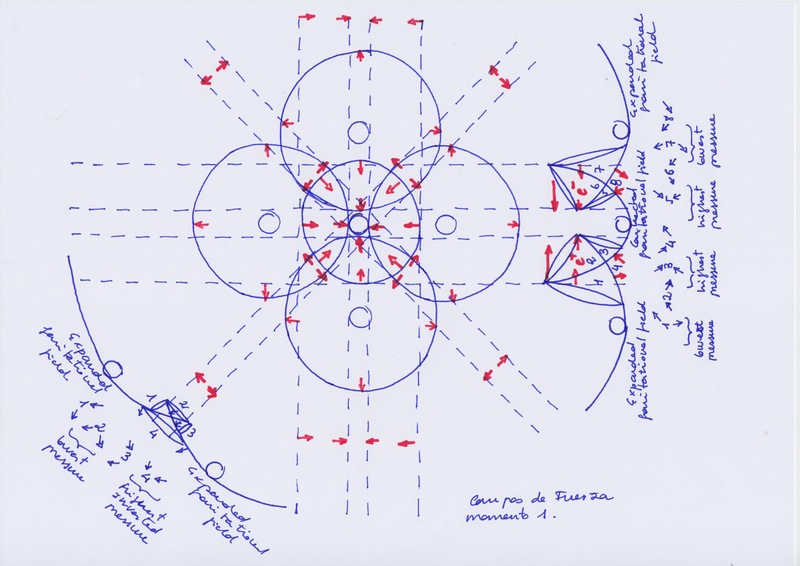 We consider bosons the fields that vary with the same phase, and fermions the fields that vary with opposite phase, as you can see in other previous posts on this blog. This model of intersect fields that vary periodically with the same or opposite phase offer a different comprehension, with clearly defined topography of the concurrent forces at the different moments, of all biological questions that are related with electricity, in fact, the whole human physiology: the called electron transfer chain, proton pumps, sodium and potassium pumps, what energy is – for us the only energy that exists is the kinetic energy created by the movement of spaces and the forces of pressure that they create on matter – and how it is created by mitochondrias, and so on. We thing that cell differentiation is related with the progressive change from the phase of variation of intersected gravitational fields. Between each expansion and contraction it would exist a period of time when it would not occur any variation, like a non time period. We think that process is similar at the progressive inversion of oceanic tides. They suffer a progressive delay and finally they finish inverted. If we visit a beach at 12 pm one they, 7 or 8 days later the tide is the opposite that we saw 8 days before. On the other hand, when the “normal” rhythms of gravitational variations and their progressive transformations, are changed in an anomalous way, it occurs for us what is currently known as a genetic mutation. How could take place a change in the normal frequency or phase of variation, the right rhythm of progressive change, characteristic from a specific molecule or tissue? How could be modify or broken the specific sequence of a gene? The distances between those entangled gravitational fields have a decisive important for us. If we approximate three gravitational fields putting them very closed from each other, the central gravitational field could be closed by the two others and it would create on the matter that exists in the central gravitational field an extra pressure that would produce an extra compression on it. If its matter is higher compressed, it will have more density and will resist stronger to be pass through it by the gravitational flux that creates the gravitational field. This resistance of matter against that gravitational flux creates the gravitational curvature and its periodical variations. So, the matter of this central field, will have more pressure on it, its mass will be much more weight than before, and the refraction of the gravitational field (its amplitud if we considered that field as a longitudinal wave) will increase. It will produce a change on its normal phase of variation, or in its frequency of variation too. The two other fields will continue its normal variations, expanding or contracting. Now the frequencies and/or phases of variation that let these fields to be entangled, have changed. Its normal functioning as a specific kind of molecule or cell has changed. There are different displacements in the intersected fields, different spacial transformations, a different distribution of pressure sand kinetic energies. Their spacial structure will change and the molecule or the cell itself could be broken. We think that it is the way that follow the biological fission, that is similar to the atomic fission, and the programmed cell death too. 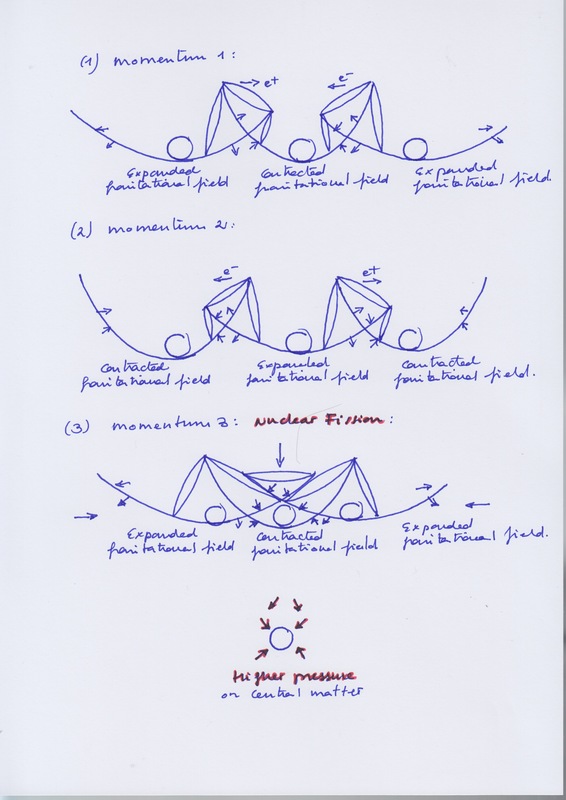 I have drawn the process in the next pictures: in the first picture below, there tree entangled gravitational fields that vary with the same phase. In the momentum 3, the fields are closer, and the direction of the kinetic energy and the pushing ascendent forces vary. In the next picture, the central field vary with different phase with respecto to the other. In the momentum 3, their material masses are placed closer and it produces that the material mass of the central gravitational field result enclosed, receiving the pressure of all the gravitational variations with the consequences that we have commented before. Although I have not drawn here the change that it would be produced in the whole structure and its possible rupture, that could be seen as a division or as a self destruction. Any way it will produce a mutatioon, a change in its normal phase of variation. Biological fission, that for us is the similar than nuclear fission, is used by bacterias and cell mitochondria. The entanglement of gravitational fields and the frequencies and phases of their periodical variation determine the “electrical properties” of that spatial structure: each resultant field will have a specific and periodically changing kinetic energies, specific volumes and pressures on them, and spatial displacements. 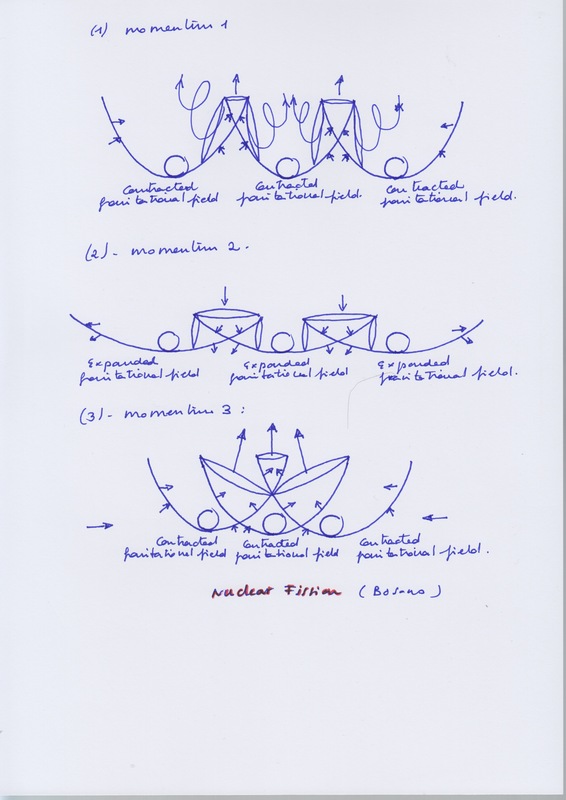 Any biological entity, a unique cell as a bacteria for example that have electrical activity is formed by at least two entangled gravitational fields with its characteristic frequencies and phases of variation, that change periodically and progressively along the time. On the other hand, we think that the four spaces created by those gravitational entanglement could represent the spaces that are used as DNA and RNA replication molds in cell division. They would represent the currently known as “replication forks” by Eukaryotic cells division. It is not the same that those replication forks have a dimension or other, that he move toward a side or the another, that they have a pressure on them or another, akinetic energy or another. because it will affect to the times and rhythms of all its proceses . We do not have a deep knowledge of biology but here we are suggesting possibilities. Because all the developments about DNA knowledge have taken place on the base of a specific atomic model that suppose that electrical positive and neutral atomic charges are forces that exist in a nucleus inside matter, and that electrical negative atomic charges are forces that exist outside of the central atomic nucleus but inside matter and in an electronic loud on it. We think that with a different model, considering electrical charges as varying spaces, a lot of possibilities for thinking in a different way are opened. We are aware that it is very difficult that these ideas could be considered currently by mainstream physics. But maybe one day these inaccurate ideas could inspire someone on their own researches. With this hope we have published them here. We will continue developing them as far as we can.